on tap at 441, du parvis, qc. unclear medium dark brown pour with a small beige cap offering some retention and lacing. spicy brown maltiness, nutty caramel, medium dark coffee roast, earthy and grassy hops, hint of sweetness - malt more than honey; no phenols at all (see previous ratings), sulphur, earthy peppercorns. moderate carbonation, light body - oily; semi-sweet roasted-earthy finish. not so bad, really. in fact, better than memories of before brewery burnt down. fair honey brown. 341 ml bottle from local IGA grocery A: nutty, chocolate, caramel, honey app: clear dark brown minimal white head t/p: med body with moderate long bitter finish. soft carbonation. o: OK. it’s more bitter than expected. Nose is good. perhaps they could make the beer a little sweetier to mimic the sweetness usually associated with honey. Douce avec un arriere gout prononce. se révèle tranquillement, mais efficacement ! Bouteille de 330ml. 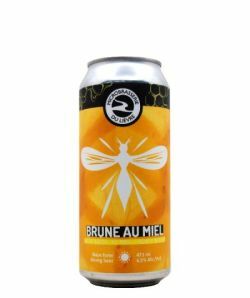 Une autre bière décevante de la micro du lièvre. Aucun caractère. Dunkel rötlichbraun, wenig beiger Schaum. Geruch röstmalzig, Kaffee, Honig, würzig. fruchtig. Geschmack schokoladig, süß, Honig, fruchtig. Brune aux reflets rougeâtre. Noisette. Malté. Caramel. Céréale rôtie. Légèrement sucré. Subtilement florale. Raisin sec. Bien mais très douce.